Everything tastes better with bacon, and dates are no exception. These sweet dates are stuffed with the rich, buttery Manchego cheese and then wrapped with salty, crispy bacon to create a perfectly delicious combination. Bacon Wrapped Dates Stuffed with Manchego make a perfect starter for any dinner entertaining and it is a MUST MAKE Spanish Tapas recipe! It is hard to make dates pretty…. And well, I just haven’t figured out how to do it. 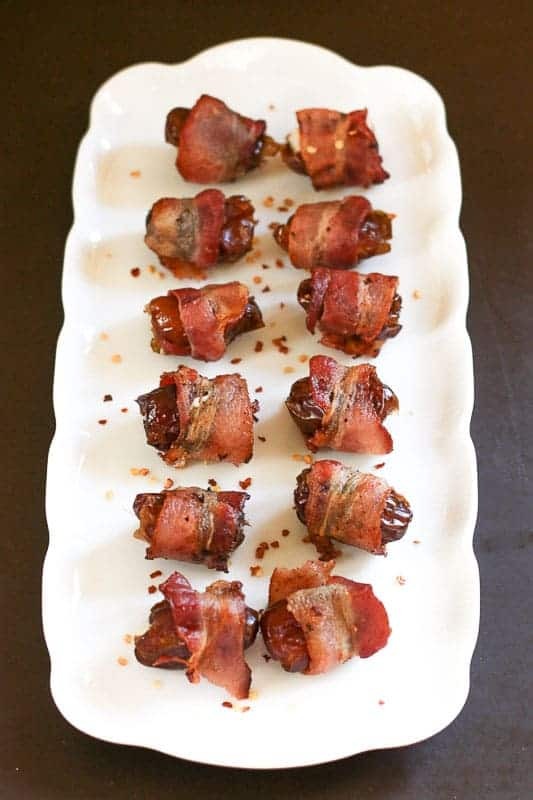 None-the-less, these bacon wrapped dates do taste amazing! I wouldn’t touch them as a child. They just looked gross to me. It was another foolish mistake I made in my youth. A friend made me try them one day after roasting them in the oven. I was like, “Sweet Heaven! What have I been missing?” I loved the sweet, rich, caramel, vanilla taste the dates become when roasted. I certainly didn’t stop at one… Then I tried bacon wrapped dates. The sweet and salty were the perfect combination. They were wicked good! Recently, I had to write an article for City View Magazine, called “Tapa Time!” featuring tapas. Dates were an easy pick to include. 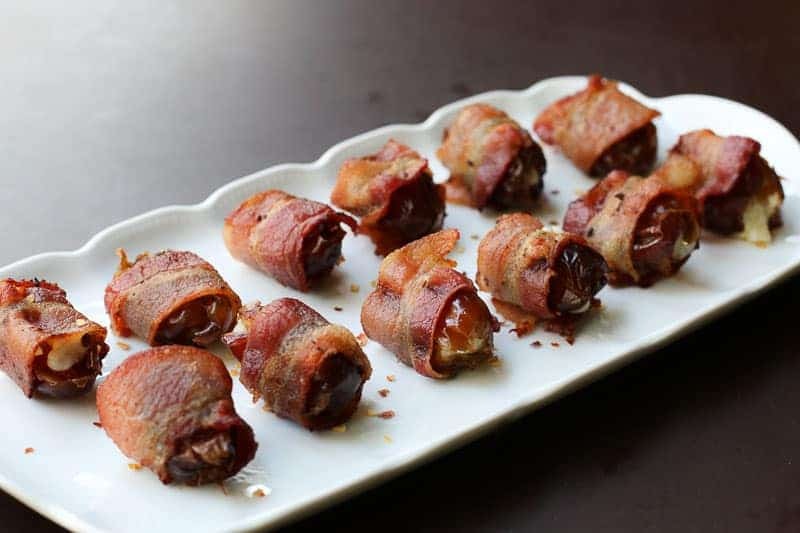 How do you make bacon wrapped dates taste even better? Stuff them with cheese. Keeping with the Spanish Tapas theme, I stuffed them with the Manchego Cheese. The Manchego Cheese has a very distinctive flavor. It is a full-developed cheese with buttery, salty flavors and a medium sharpness. The cheese integrates magnificently with the dates and bacon. Add some red pepper flakes if you like a little heat. I love salty, sweet, and spicy combinations. 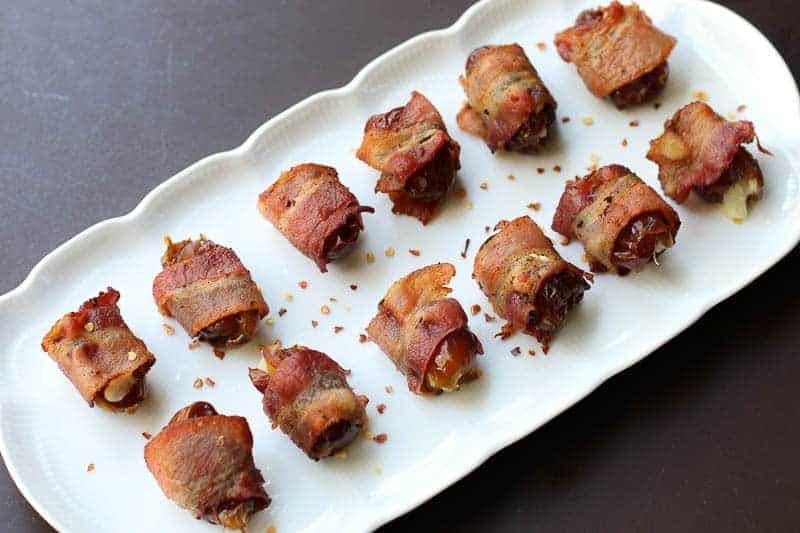 This Bacon Wrapped Dates Stuffed with Manchego Cheese recipe are easy to prepare. Or you can make them all for yourself… with a little glass of wine…. Because life is short, why not? If you like this recipe, check out Pomegranate Red Wine Sangria, Mussels with Sofrito, and Gia in Greensboro, NC. These sweet dates are stuffed with the rich, buttery Manchego cheese and then wrapped with salty, crispy bacon to create a perfectly delicious combination. Bacon Wrapped Dates Stuffed with Manchego make a perfect starter for any dinner entertaining and it is a MUST MAKE Spanish Tapas recipe! Partially cook bacon, stopping before it becomes crispy. Chop Manchego cheese into 12 small blocks, sized to stuff in dates. Wrap dates with bacons, securing with toothpicks. Cook in oven for 10 minutes or until bacon becomes fully crispy. Serve with or without toothpicks. Beautiful salty sweet recipe. Was a hit at my get together on the weekend. It really highlight my home made manchego cheese. Had these at cocktail parties, and loved them, but never made them myself. How easy! I’ve had something like this before in a local restaurant except it had either feta or blue cheese and a sauce that had to have balsamic vinegar in it. So yummy. I love bacon wrapped anything but adding manchego cheese and dates sprinkled with hot pepper flakes and I’m all in!! Yummy!! These are so amazing Katie!! Thanks for the awesome posts! !